The perfect Christmas Dessert !! Whip Cream on high until stiff peaks form. Fold the whipped creme into the Pastry Creme until combined. Slice each white cake into 3 equal layers. Place one layer of cake on oven proof plate. Spread a dollop of creme over layer leaving 1/2 inch margin of cake. creme should be about 1/ 2” thick. Place another layer of cake and repeat creme, cake, cream, cake. build a cake 4 layers high ending with cake as the top layer. Spread meringue generously over top and sides with rubber spatula. 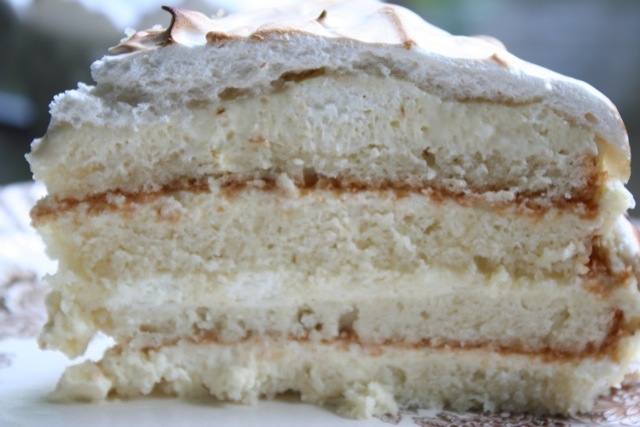 Place cake in oven to brown meringue. about 1-2 minutes . Watch carefully not to burn. Slide cake onto Serving Plate. 12 tablespoons Butter(2 sticks) – Room Temp. Whisk lightly, Egg Whites, 1/2 cup Milk and Vanilla. Set Aside. In Large bowl combine Flour, Sugar, Baking Powder and Salt. Mix in Butter and remaining milk. Beat on medium for 1 minute. Add half the egg mixture and beat for 30 seconds. Add remaining half and beat for another 30 seconds. Pour batter evenly into baking pans smoothing tops so there are no highs and lows. Bake for 30 minutes. Check for doneness bu inserting a wooden skewer into the cake center. when it comes out clean cake is done. Cool on wire rack for 10 minutes. Invert onto wire rack. let cool completely. Beat whites until frothy. Add lemon juice,and vanilla. Add in sugar slowly and beat until stiff glossy peaks form. Pour Milk, 3 tablespoons sugar, and zest into a saucepan. Remove from heat. Remove zest. Whisk yolks and remaining sugar until combined. Add Flour in small increments whisking well after each addition until smooth. Whisk hot milk into the yolk mixture in small increments beating continuously. Pour mixture back into saucepan, cook on med heat stirring continuously until mixture thickens. Once thickened stir and cook for another few minutes. Cool Custard completely stirring frequently to avoid skin forming on top. This entry was posted on Thursday, December 25th, 2014 at 4:29 pm	and posted in Category. You can follow any responses to this entry through the RSS 2.0 feed.